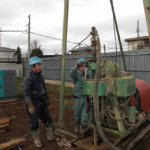 HM-DP1400 geotechnical drilling rig is a deep core drilling rig with complete functions. It’s suitable for alloy, diamond core drilling, exploration and geological drilling, and construction projects, water power engineering project, high way, railway and port, etc drilling projects. 1. HM-DP1400 geotechnical drilling rig adopts auto vehicle transmission and clutch, good speed gear, easy operation. 2.Vertical diameter is 93mm, long feeding distance, high drilling efficiency, which greatly reduces drilling accidents. 3. Light weight structure, good disassembility, the max part weight after disassembling is 300kgs, convenient for moving. 4.Big rig power, high efficiency, and lifting force strength. Equipped with water brake, hand oil pump, smooth and safe drilling. 5.The hydraulic system could control the feed pressure and speed to meet the requirements of different drilling conditions. 6. Light weight, demontierbraket, easy operation and maintaining.